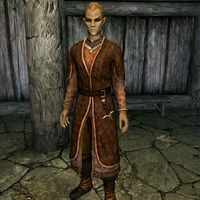 Nenya is an Altmer elemental mage who serves as steward to the Jarl of Falkreath. She served under Dengeir of Stuhn and continues to serve for his nephew Siddgeir. Due to Siddgeir's absentee leadership, she is seen as the true leader of Falkreath and helps to oversee its day to day operations. She wears a set of fine clothes and a pair of fine boots. She is equipped with an iron dagger, and carries a key to the longhouse, as well as a selection of common loot and gold. Nenya spends all of her time in the hall. The only exception to this routine is if the Stormcloaks take over Falkreath, as she'll then spend her entire life in the basement of the Blue Palace. When greeted she'll introduce herself, saying, "I'm the Steward here. I serve under Jarl Siddgeir and Jarl Dengeir before him." When greeted she may also say, "Siddgeir can sometimes act too quickly but he does listen to Helvard and I." and "For Falkreath and I this is just one more war in a long line." If you ask her why the cemetery is so large, she'll say, "Many battles have been fought here over the centuries. Graves were dug and monuments built, and the town grew around these. In time, Falkreath came to be known as the heroes' graveyard. Many noble Jarls and renowned warriors asked to be buried here. Falkreath's reputation has faded somewhat, but the graves remain, reminding us of the one inevitable truth of life." When you ask her how long she has been steward, she'll say, "It was Dengeir who made me a steward, long ago when he was young. When Dengeir's health began to fail, young Sidgeir [sic] was appointed Jarl in his stead. It was simpler just to keep me as steward. Sidgeir [sic] has no interest in running his hold, and so leaves such matters to me. As for my part, I do my best to see that folk are treated fairly." When exiting conversation, she'll say, "May wisdom forever light your path." or "Be safe, traveler."